Luc Besson (French pronunciation: ​[lyk bɛsɔ̃]; born 18 March 1959) is a French film director, screenwriter, and producer. He directed or produced the films Subway (1985), The Big Blue (1988), and Nikita (1990), all using a distinctive style dubbed Cinéma du look by critics. Besson has been nominated for a César Award for Best Director and Best Picture for his films Léon: The Professional and The Messenger: The Story of Joan of Arc. He won Best Director and Best French Director for his sci-fi action film The Fifth Element (1997). He wrote and directed the 2014 sci-fi thriller film Lucy. In 1980, he founded his own production company, called Les Films du Loup, and later Les Films du Dauphin. This was superseded in 2000 by his co-founding EuropaCorp film company with his longtime collaborator, Pierre-Ange Le Pogam. As writer, director, and/or producer, Besson has so far been involved in the creation of more than 50 films. Besson was born in Paris, to parents who both worked as Club Med scuba-diving instructors. Influenced by this milieu, as a child Besson planned to become a marine biologist. He spent much of his youth traveling with his parents to tourist resorts in Italy, Yugoslavia, and the Kingdom of Greece. The family returned to France when Besson was 10. His parents promptly divorced and each remarried. "Here there is two families, and I am the only bad souvenir of something that doesn't work," he said in the International Herald Tribune. "And if I disappear, then everything is perfect. The rage to exist comes from here. I have to do something! Otherwise I am going to die." At the age of 17, Besson had a diving accident that left him unable to dive. "I was 17 and I wondered what I was going to do. ... So I took a piece of paper and on the left I put everything I could do, or had skills for, and all the things I couldn't do. The first line was shorter and I could see that I loved writing, I loved images, I was taking a lot of pictures. So I thought maybe movies would be good. But I thought that to really know I should go to a set. And a friend of mine knew a guy whose brother was a third assistant on a short film. It's true," he said in a 2000 interview with The Guardian. "So, I said: 'OK, let's go on the set.' So I went on the set...The day after I went back to see my mum and told her that I was going to make films and stop school and 'bye. And I did it! Very soon after I made a short film and it was very, very bad. I wanted to prove that I could do something, so I made a short film. That was in fact my main concern, to be able to show that I could do one." Out of boredom, Besson started writing stories, including the background to what he later developed as The Fifth Element (1997), one of his most popular movies. The film is inspired by the French comic books which Besson read as a teenager. He reportedly worked on the first drafts of Le Grand Bleu while still in his teens. Besson directed and co-wrote the screenplay of this science fiction thriller with the screenwriter, Robert Mark Kamen. At 18, Besson returned to his birthplace of Paris. There he took odd jobs in film to get a feel for the industry. He worked as an assistant to directors including Claude Faraldo and Patrick Grandperret. Besson directed three short films, a commissioned documentary, and several commercials. After this, he moved to the United States for three years, but returned to Paris, where he formed his own production company. He first named it Les Films du Loup, but changed it to Les Films du Dauphin. In the early 1980s, Besson met Éric Serra and asked him to compose the score for his first short film, L'Avant dernier. He later used Serra as a composer for other films of his. Since the late 20th century, Besson has written and produced numerous action movies, including the Taxi (1998–2007) and The Transporter (2002–2008) series, and the Jet Li films Kiss of the Dragon and Unleashed/Danny the Dog. His English-language films Taken, Taken 2 and Taken 3, all starring Liam Neeson, have been major successes, with Taken 2 becoming the largest-grossing export French film. Besson produced the promotional movie for the Paris bid for the 2012 Summer Olympics. Besson won Best Director and Best French Director for his film The Fifth Element (1997). he was nominated for Best Director and Best Picture César Awards for his films Léon: The Professional (1994) and The Messenger: The Story of Joan of Arc (1999). French actor Jean Reno has appeared in several films by Besson, including Le dernier combat (1985), Subway, The Big Blue (1988), Nikita (1990), and Léon: The Professional (1994). Critics cite Besson as a pivotal figure in the Cinéma du look movement, a specific, highly visual style produced from the 1980s into the early 1990s. Subway (1985), The Big Blue (1988) and Nikita (1990) are all considered to be of this stylistic school. The term was coined by critic Raphaël Bassan in a 1989 essay in La Revue du Cinema n° 449. A partisan of the experimental cinema and friend of the New Wave ("nouvelle vague") directors, Bassan grouped Besson with Jean-Jacques Beineix and Leos Carax as three directors who shared the style of "le look." These directors were later described critically as favoring style over substance, and spectacle over narrative. Besson, along with most of the filmmakers so categorized, was uncomfortable with the label, particularly in light of the achievements of their forebears: France's New Wave. "Jean-Luc Godard and François Truffaut were rebelling against existing cultural values and used cinema as a means of expression simply because it was the most avant-garde medium at the time," said Besson in a 1985 interview in The New York Times. "Today, the revolution is occurring entirely within the industry and is led by people who want to change the look of movies by making them better, more convincing and pleasurable to watch. "Because it's becoming increasingly difficult to break into this field, we have developed a psychological armor and are ready to do anything in order to work", he added in this same interview. "I think our ardor alone is going to shake the pillars of the moviemaking establishment." Besson directed a biopic of Aung San Suu Kyi called The Lady (original title Dans la Lumiere), which was released in the fall of 2011. He also worked on Lockout, which was released in April 2012. Many of Besson's films have achieved popular, if not critical, success. One such release was Le Grand Bleu. "When the film had its premiere on opening night at the 1988 Cannes Film Festival, it was mercilessly drubbed, but no matter; it was a smash," observed the International Herald Tribune in a 2007 profile of Besson. "Embraced by young people who kept returning to see it again, the movie sold 10 million tickets and quickly became what the French call a 'film générationnel,' a defining moment in the culture." Besson created the Arthur series, which comprises Arthur and the Minimoys, Arthur and the Forbidden City, Arthur and the Vengeance of Maltazard and Arthur and the War of the Two Worlds. He directed Arthur and the Invisibles, an adaptation of the first two books of the collection. A film with live action and animation, it was released in the UK and the US and starred Freddie Highmore, Madonna, Snoop Dogg, Mia Farrow, Robert De Niro and David Bowie. Besson has been described as "the most Hollywood of French filmmakers." Scott Tobias wrote that his "slick, commercial" action movies were "so interchangeable—drugs, sleaze, chuckling supervillainy, and Hong Kong-style effects—that each new project probably starts with white-out on the title page." American film critic Armond White has praised Besson, whom he ranks as one of the best film producers, for refining and revolutionizing action film. He wrote that Besson dramatizes the struggle of his characters "as a conscientious resistance to human degradation". Besson has been married four times; first, in 1986, to actress Anne Parillaud who starred in Besson's Nikita (1990). Besson and Parillaud had a daughter, Juliette, born in 1987. The couple divorced in 1991. Besson's second wife was actress Maïwenn Le Besco, who was 15 when they began dating in 1991. They were married in late 1992 when Le Besco was pregnant with their daughter Shanna, who was born on 3 January 1993. Le Besco later claimed that their relationship inspired Besson's film Léon (1994). Their marriage ended in 1997, when Besson became involved with actress Milla Jovovich during the filming of The Fifth Element (1997). He married the 22-year-old on 14 December 1997, at the age of 38, but they divorced in 1999. On 28 August 2004, at the age of 45, Besson married film producer Virginie Silla. The couple has three children: Thalia, Satine, and Mao Besson. Among Besson's awards are the Brussels International Festival of Fantasy Film Critics Prize, Fantasporto Audience Jury Award-Special Mention, Best Director, and Best Film, for Le Dernier Combat in 1983; the Italian National Syndicate of Film Journalists Silver Ribbon-Best Director-Foreign Film, for La Femme Nikita, 1990; the Alexander Korda Award for Best British Film, Nil by Mouth, 1997; and the Best Director Cesar Award, for The Fifth Element, 1997. In 2000, Besson superseded his production company by co-founding EuropaCorp with Pierre-Ange Le Pogam, with whom he had frequently worked since 1985. Le Pogam had then been Distribution Director with Gaumont. EuropaCorp has had strong growth based on several English-language films, with international distribution. It has production facilities in Paris, Normandy, and Hollywood, and is establishing distribution partnerships in Japan and China. ↑ "Luc Besson", Contemporary Authors Online, Gale, 2008. ↑ Hayward, Susan (1998). Luc Besson. Manchester: Manchester university press. p. 42. ISBN 978-0-7190-5076-3. Retrieved 6 September 2011. 1 2 "Luc Besson," International Dictionary of Films and Filmmakers, Volume 2: Directors, 4th ed. St. James Press, 2000. ↑ Elley, Derek. "Pop pic auteur", Variety, 23 June 1997, v. 367 n. 8, pp. 44–45. ↑ Tremblay, Anne (21 July 1985) "France Breeds a New Crop of Auteurs", The New York Times,. ↑ Sobel, Ian (9 June 2011) "‘Looper’, ‘Anonymous’, And ‘Lockout’ Do The Release Date Shuffle'", Screenjunkies.com. ↑ Tobias, Scott (20 May 2007). "Le Cinéma du Blockbuster", The New York Times, Retrieved 13 March 2011. ↑ Tobias, Scott (5 May 2006). "District B13", The Onion. Retrieved 13 March 2011. ↑ White, Armond (28 January 2009). "We Need New Heroes: Taken", New York Press. Retrieved 1 February 2009. ↑ Shanna Besson. Sbs.com.au (15 August 2012). Retrieved on 20 September 2013. ↑ Kee, Chang; Stevens, Victoria (5 May 2012). Maïwenn's "Polisse". Anthem Magazine, 5 May 2012. "Text: Kee Chang Images: Victoria Stevens". Retrieved on 20 September 2013 from http://anthemmagazine.com/film-critic-maiwenns-polisse/. ↑ karenr (29 September 2005). "Besson Becomes A Father For The Fifth Time". Blog, SFGate, 29 September 2005. 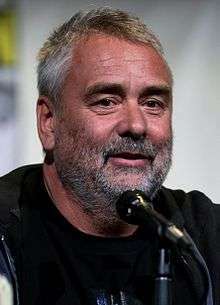 Retrieved from http://blog.sfgate.com/dailydish/2005/09/29/besson-becomes-a-father-for-the-fifth-time/.